Tom Bentley was an avid fan and player of baseball throughout his life. He was part of the Baldwinsville Academy (High School) baseball teams that were recognized in the Baseball Hall of Fame. He continued playing for local company leagues as he got older. I remember mom wondering if he was out for a beer one time when he didn't come home after a game, only to find out he was hit by the batter (he played catcher) and was in the hospital with a good lump on his head ! He had us kids play little league ( I was not a good player ;-) ) as we grew up. He loved watching baseball games and he was a Boston fan. The finest tribute ever paid to Baldwinsville academy athletics in any sport came early this summer when the National Baseball Hall of Fame at Cooperstown, through Robert A. Quinn, director, announced that it was accepting for permanent display the record and pictures .of the Baldwinsville academy baseball teams which compiled a record of 46 consecutive Onondaga County league victories in a period which opened on May 28,1946 and was finally brought to an end on June 13,1950. 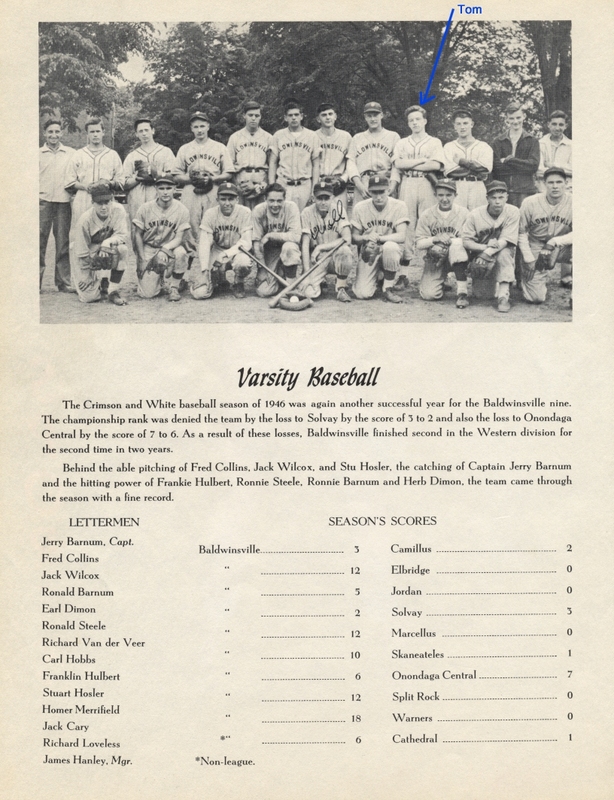 When 300 Baldwinsville residents and Baldwinsville academy's baseball team visited the National Baseball Hall of Fame at Cooperstown on May 27,1950, they saw displayed there the temporary record Baldwinsville teams compiled there under date of May 12. 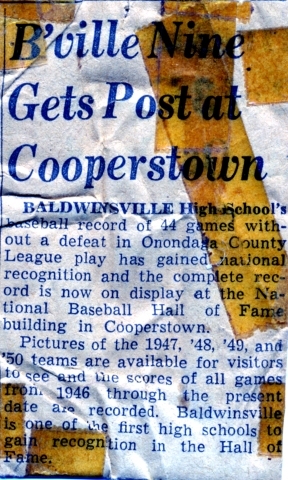 The temporary record display posted there at the time was placed there with the intent that Baldwinsville, as soon as its 1950 baseball season was completed, would bring that permanent record up to date, frame it under glass, and present it to the National Baseball Hall of Fame at Cooperstown. That permanent picture and printed record has now been completed, is being framed this week, and an official delegation of Baldwinsville school authorities and representatives of the local school's baseball teams from 1946 through 1950, will accompany this framed record to Cooperstown Saturday for the official presentation to Director Quinn who will accept it for permanent display in the national shrine of baseball, the hall given over to baseball's immortals. 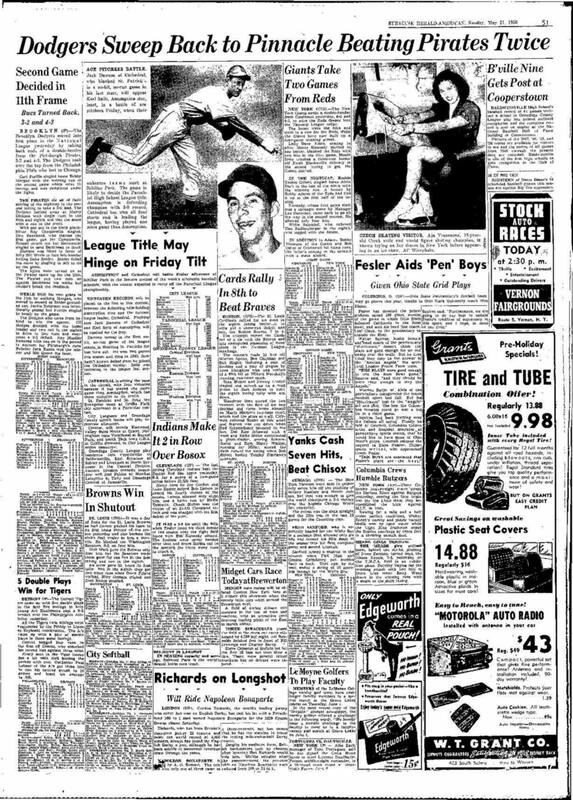 The extent of recognition given to Baldwinsville by acceptance of this phenomenal high school record compiled by Baldwinsville teams for display in baseball's national shrine is not as thoroughly appreciated by people throughout the community who have only a passive interest in baseball, as it might well be. To these people it should be pointed out that the National Baseball Hall of Fame at Cooperstown, the community that is generally regarded as the birthplace of America's national game, is the game's shrine where the pictures and records of only baseball's greatest immortals are kept. Until now, it has been the place where only the records of the super-stars among this country's greatest all-time professional baseball stars were enshrined. To the people who know baseball from coast to coast, the honor paid Baldwinsville and its teams of the past five seasons, is the highest that baseball can pay. Baldwinsville is the first public high school in the entire United States to have its baseball record given the recognition of permanent display in the National Baseball Hall of Fame. 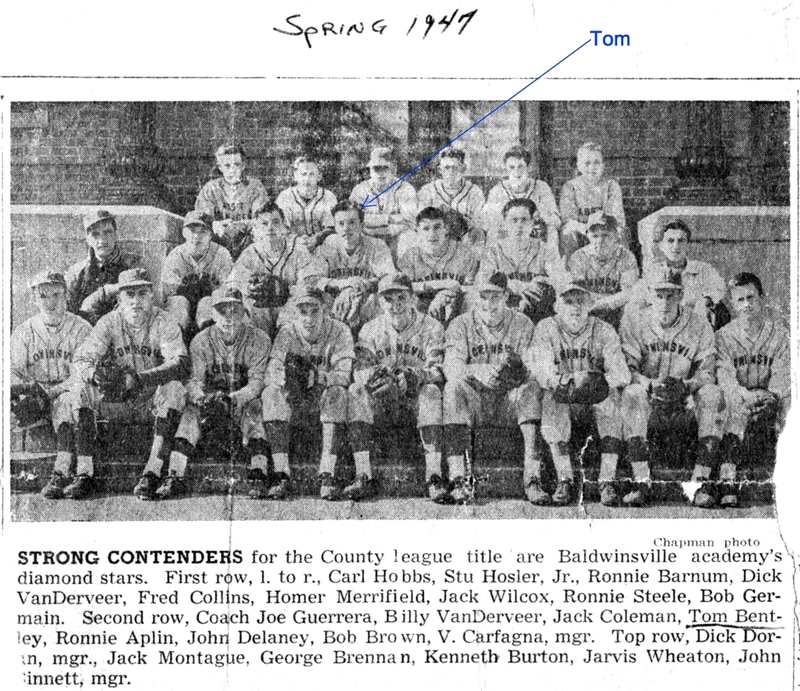 To the longest days of their lives, all Baldwinsville and vicinity people, and particularly all Baldwinsville players who participated on the academy's teams of 1946,1947,1943,1949 and 1950, Coach Joseph-Guerres and Don Coates, now in the Marine corps who assisted Coach Guerrera during several of these seasons, can be deservedly proud of the remarkable recognition singled out for Baldwinsville. All seniors had a theme song associated with them... Tom Bentley's was " Take Me Out To The Ball Game" . The Class prophesy was that in the future, Baldwinsville would be a great city and it went through that roles of each of the senior students would play... "Tommy Bentley...would be part of the All-American team playing in the Syracuse Armory"